One wild and windy night, the Gruffalo's Child ignores her father's warnings and bravely tiptoes out into the snow into the deep, dark wood in search of the "Big Bad Mouse." Along the way, she meets Snake, Owl and Fox but no sign of the fabled Mouse. Described by her father as "terribly big" and "terribly bad," the mouse proves to be terribly hard to find. Does he exist or doesn't he? 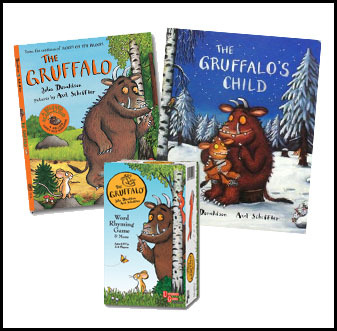 This beautifully animated film based on the best-selling children's picture book by author Julia Donaldson and illustrator Axel Scheffler, The Gruffalo's Child is a companion film to the hugely successful, academy award nominated, The Gruffalo. Directed by Johannes Weiland & Uwe Heidschötter with an all star English cast that includes Helena Bonham Carter, Rob Brydon, Robbie Coltrane, James Corden, Shirley Henderson, John Hurt and Tom Wilkinson. Keep up with new movies, discounts, and giveaways at Kidtoons on Facebook and Twitter. Use Twitter hashtag #KTGruffalo for this movie. Here is a link for The Gruffalo's Child Movie Trailer. The rafflecopter is cut off so you can't enter. Thank you Rebecca! All fixed now. It wasn't cutting off on Safari but when I checked with Firefox it was. I would have never noticed that...Thank you!!!! I would love the chance to win this to share with the kids in my life. Thanks for the chance! My daughter loves the gruffalo story as well. I love the gruffalo! I'd love to win :-) thanks for the giveaway. We would very much enjoy the dvd and other items in the prize pack. We love books. Thank you for a chance to win. Thank you for such a neat giveaway! Thank you for the giveaway! My grandson would enjoy this. This would be cute for my nephew! Fun, great for the grandma cabinet. My grandson would love this giveaway! I have never read or seen a Gruffalo story. It looks and sounds wonderful! This is a great giveaway. My family would love this. Thanks. Thanks for a wonderful giveaway, my kids love The Gruffalo! My son would absolutely love this! Thank you for the chance to win! What a wonderful prize pack! I would love to win this prize pack for my daughter. I would love to win this for my granddaughter nellie. What fun! The Gruffalo is a favorite, so I'm sure this would be. Thanks for the chance, my son would love this! My son would love for me to win this. i think my daughter would love this!! thanks for the chance! They look like cute stories. My daughter loved the first Gruffalo. Thanks for the giveaway! Thank you for having this awesome giveaway. Thankyou for the giveaway! Good luck everyone!! Traci W.
We would really like this. Thanks for the giveaway. As a homeschooling mom to three young daughters, I would LOVE to win this! We fell in love with the original Gruffalo book and movie last holiday season and I would be so happy to surprise them with this! How do I not know about this series? I'm an elementary teacher with two young kids! Geesh...it looks great! I have never read these to my kids yet! The Gruffalo looks great! I would love to win this. I teach 3rd and 4th grade kids at church. Plus my own grands. I would love to win this package for my grandson and his friends.